How do you make your intranet more exciting? Here are 7 tips. Discover 7 ways to make your company intranet easier and more exciting to help drive employee productivity and engagement. 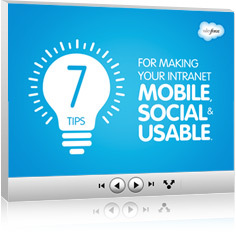 Download your free “7 Tips For Making Your Intranet Mobile, Social and Usable” now.